Harry and his bucket of dinosaurs are not looking forward to going to play with a girl called Charlie. There’s no way out, however, as Nan and Mum are taking Harry’s big sister Sam to visit her new school. The dinosaurs are hiding because they are afraid that Charlie will manhandle them, but Harry assures them that he won’t let her touch them. Into the bucket they go, and Harry gets into the family car. Poor Nan has to sit between Harry and Sam because they don’t exactly get along well together. When Harry is dropped off at Charlie’s house, he hides the bucket of dinosaurs behind his back and looks rather glum. The two children go indoors and sit at opposite ends of the sofa with their toys. But Charlie soon gets up and starts filling a big basket with toys, cushions, boxes, string, and even plants. It looks so interesting that Harry and the dinosaurs go after her into the garden to see what she’s up to. The dinosaurs realise straight away that Charlie is making a primeval swamp, and the garden hose is hissing away, just like an enormous snake. Lots of fun ensues, during which Tyrannosaurus has to be rescued from the snake’s deadly grip and the basket serves as a cage to capture the snake. The children and the dinosaurs end up having tea in the garden, and by the time he is picked up Harry has decided that he – and the dinosaurs, of course – would definitely like to come back and play with Charlie again. 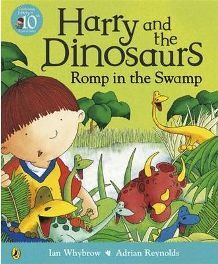 ‘Romp in the Swamp‘ is one of a series of books about Harry and his bucketful of dinosaurs that are hugely popular with young children, partly because they tie in with a television series too. Author Ian Whybrow’s books usually deal with situations that children might find very daunting, such as the first day at school or a visit to the dentist, and show that they can turn out to be enjoyable rather than something to worry about. ‘Romp in the Swamp’ is obviously no exception, as a young child could feel very nervous about going to a strange house to play with another child he doesn’t know while the rest of his family have gone somewhere without him. The story is full of fun and might help to reassure a child that going to visit another family should be an occasion to look forward to. It’s also a story that shows young children having a great time with imaginative play. The text is in a large, clear font and there are rarely more than four lines per page, superimposed on a light-coloured area of the illustrations. There are of course names of dinosaurs such as Scelidosaurus and Apatosaurus, but I often find that young children are pretty good at learning these, partly because they just love dinosaurs. Other than these names, the vocabulary used is straightforward, but this is essentially a picture book for reading aloud. Because it involves dinosaurs and is so entertaining, it might still appeal to a confident young reader of perhaps six years old to read independently or share with a younger sibling. Adrian Reynolds’ illustrations for ‘Romp in the Swamp‘ are colourful and bold, mainly using primary colours with plenty of green. They fill the pages and more often than not are double spreads. The dinosaurs always have suitable facial expressions, often open-mouthed, and always look enthusiastic when things are exciting and fun. The garden hose ‘snake’ is a yellow and red yellow striped one that stands out perfectly against the grass and leaves, as well as the blue plastic basket used to capture him. It is hard to go wrong with picture books about dinosaurs with most young children, and I have always found that Harry and the bucketful of dinosaurs have a tremendous appeal. I have used ‘Romp in the Swamp‘ as the basis for a drama session with four-year-olds, and they love pretending to be dinosaurs, especially when they can ‘Raaaah!’ This is a book I would definitely recommend, perhaps for children as young as two. It’s great fun to read aloud. No Comments on "Harry and the Dinosaurs Romp in the Swamp"